SXSW ended a little over a week ago but that hasn’t stopped me from wishing I could relive it over again every day since. Austin’s world renowned music/film/interactive festival tips the scale on the discovery of new additions to your playlists more than its contemporaries full of major-label radio mainstays that are impossible to escape on Instagram — hashtag “chella.” From Mexico to Japan to Australia, you would be hard pressed not to discover a new band you hit repeat for. For me this year, that came in the form of 22-year-old Irish dream-pop singer/songwriter Birdie Monds-Watson, also known as SOAK. Last year, I caught a couple sets at BBC Music and the British Music Embassy’s SXSW showcase and found several bands I’ve since had in heavy rotation, so without even checking the lineup, I wandered into Latitude 30 again this year certain that I would find something to literally write home about — I was hooked from the first song of SOAK’s set. “Knock Me Off My Feet” is the first single off SOAK’s forthcoming album Grim Town (due in late April) and it’s an ear worm full of defiance. 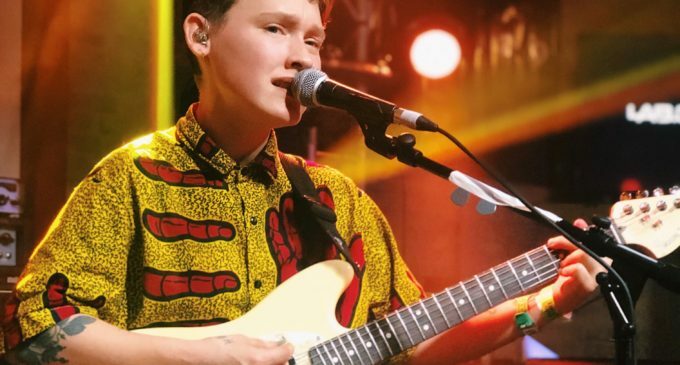 Gone are the days of SOAK’s somber self-depreciating tracks, at least for now. That’s not to say SOAK is any less heartbroken, but it seems with “Knock Me Off My Feet” she has since moved on from the sad, sulking phase of love lost and is now demanding closure on her own terms. She bounces through lyrics like “Karaoke and a cracked up glitter ball/Bonnie and Jack just needed more/You let us down, what for” covered in an infectiously optimistic beat. SOAK is asking questions and taking names. Sounds like: A lovechild of The Drums and Best Coast.